The PE Curriculum at Hutton CE Primary School operates on a ‘Sport for All’ philosophy, where children participate and develop their own physical skills and strategies according to their own abilities. 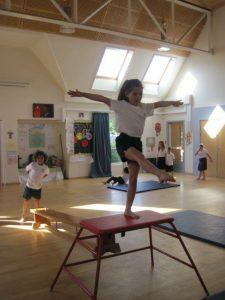 In accordance with the National Curriculum, all children are taught to develop the fundamental skills of movement skills in key areas such as throwing and catching, running, jumping, coordination and flexibility. They are also taught how to use these skills with in specific game situations. We give the children opportunities to compete against children in other local schools in a range of sporting activities from individual fixtures to local and regional tournaments. We also nurture our gifted and talented sports people by holding specific gifted and talented sessions with qualified coaches. At Hutton we encourage all children to participate and enjoy a wide variety of sporting and outdoor activities. Sports coaches come to work with a varying range of ability children to enjoy active sessions in areas such as team building and forest school activities as well as trying new and different sports. All Key Stage 2 classes attend a day of Outdoor and Adventurous activities at Mendip Outdoor Pursuits. Throughout Key Stage 2 they will experience activities such as caving, rock climbing, abseiling, canoeing, tobogganing, archery, bush craft activities and hiking. The National Curriculum requires all children leaving Primary School are able to swim at least 25 meters. Our current Swimming Policy is to provide swimming lessons to all children in Year 6 that are unable to swim 25 meters. At Hutton CE Primary School, children start swimming lessons in the spring term of Year 3 and continue with weekly lessons in the autumn term of Year 4. If they have achieved their 25 meters they then stop their weekly lessons. If they have not yet achieved this, they will continue with their weekly lessons until they achieve the award, or stronger swimmers they are encouraged to achieve further distances such as 50m, 100m and some even further. At Hutton CE Primary School, we encourage and develop a healthy competitors attitude. We have adopted the ‘School Games Values’ of respect, honesty, teamwork, self-belief, passion and determination. 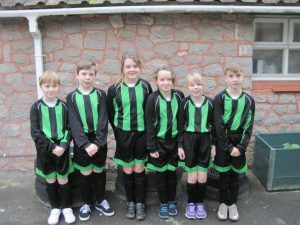 We encourage children to participate in a variety of competitions from intra-school competitions as well as a variety of inter school competitions through Kaleidoscope MAT and North Somerset Schools PE Association. Dancing for an audience is a big passion at Hutton and we take part in the annual North Somerset Dance Festival as well as the annual Churchill Dance Their Socks Off event. We also try to include dancing into our topic work and regularly have visitors in to teach us special types of dancing including STOMP, Indian dancing and belly dancing to name a few. In Year 6, all the children participate in Bikeability where they learn road awareness and safety on a bike. In Key Stage 2, all children work towards gaining a Sports Hall award. 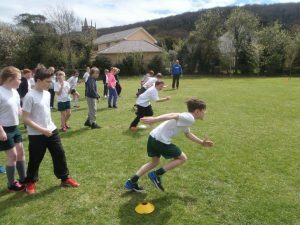 During the summer term, they work with Mr Millard from North Somerset Athletics Association to learn and develop athletics skills such as sprinting, jumping, throwing and long distance. They then perform these skills to the best of their ability. Their points are added up and they achieve a level from 1-10 and for the very able children they may achieve an award of bronze, silver or gold. We have even had some children receiving national and European records. At Hutton CE Primary School, all children and staff complete a mile a day. Some of the children walk the distance, some jog some of the distance and some of the children are able to run the whole distance. This challenge has been greatly received by all of the school and it has helped increase everyone’s fitness levels as well as help improve the focus and concentration of the children on their learning. Please refer to your child’s class curriculum maps to find the days of your child’s PE sessions. For the last 2 years running, we have been awarded Healthy School status for our dedication to developing a healthy school. We have focused on developing areas including healthy eating and a healthy packed lunch, encouraging less active children to enjoy a variety of different activities and starting our mile-a-day initiative. 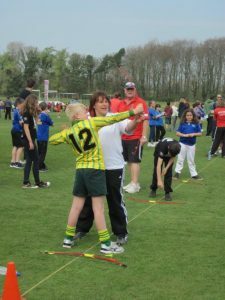 These are the skills that are covered in each year group and are taught through a variety of sports including a wide variety of team and invasion games, athletics, gymnastics, outdoor and adventurous activities dance and fitness activities year group.